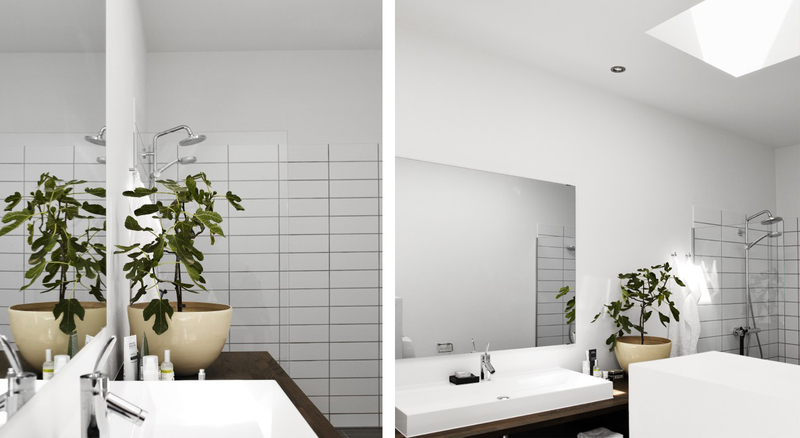 Scroll down to view a selection of Bathrooms transformed by VELUX Roof Windows and Sun Tunnels. 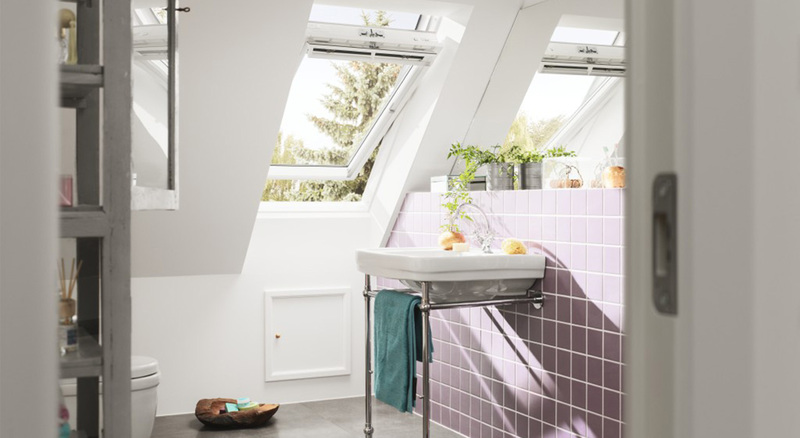 A line of two VELUX Roof Windows fills this upper storey Bathroom – and its shower – with sunlight. The upper window is out of reach and is therefore an electrically-operated VELUX INTEGRA® Roof Window. It can be programmed to ventilate the room even when you are away – and it will close automatically if it begins to rain. Both windows have a maintenance-free polyurethane finish and are fitted with durable, moisture-resistant VELUX Venetian Blinds. 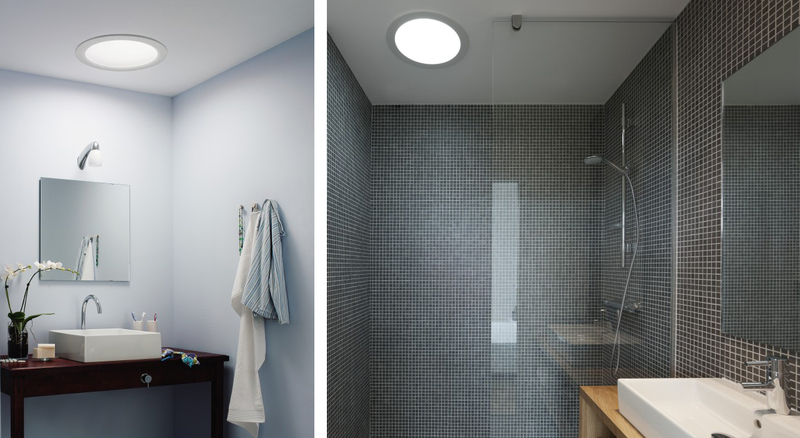 VELUX Sun Tunnels make it possible to bring natural light to every corner of your home – and also to areas where traditional Roof Windows might not be a realistic option. Even on a cloudy day, these cost-effective Sun Tunnels provide as much light as a conventional 60 watt bulb. The exterior design also matches that of other VELUX Windows. 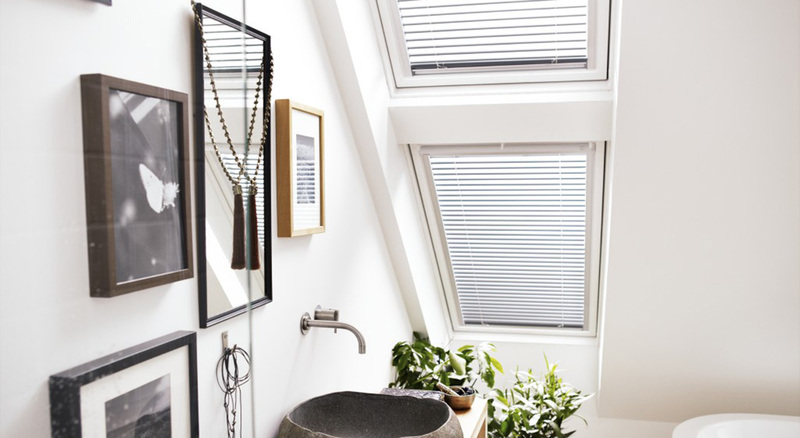 A VELUX Flat Roof Window is a great way to add a new dimension to any room under a flat roof. So whether a Roof Window is the only way to bring in natural light, or you want to create a brighter, more open feel in a room with facade windows, Flat Roof Windows are the perfect solution. Fresh air and daylight fill the entire Bathroom and give you the perfect moment of silence and privacy. The upper window is a remote-controlled VELUX INTEGRA® Roof Window which can be programmed to ventilate the room even when you are away and to close automatically if it begins to rain. Both VELUX Windows have a maintenance-free polyurethane finish and are fitted with durable, moisture-resistant VELUX Venetian Blinds. 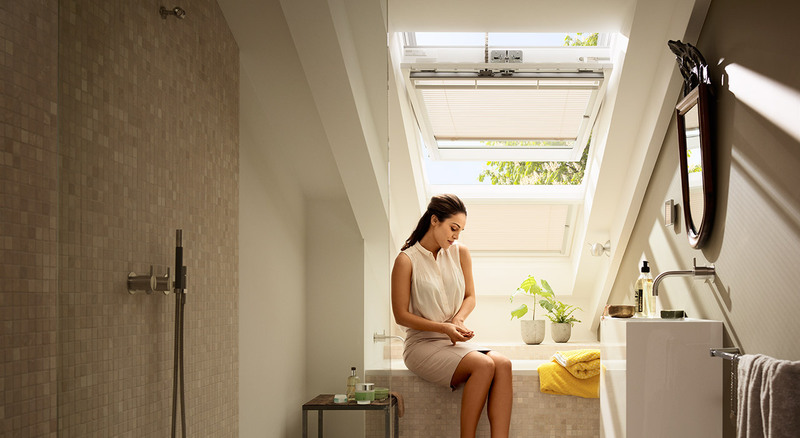 The maintenance-free polyurethane finish of VELUX Roof Windows is perfect in a moisture-rich Bathroom environment. The white finish lightens up the space and lets the sun fill the entire room.